This topic contains 42 replies, has 13 voices, and was last updated by OldBen1 3 months, 2 weeks ago. 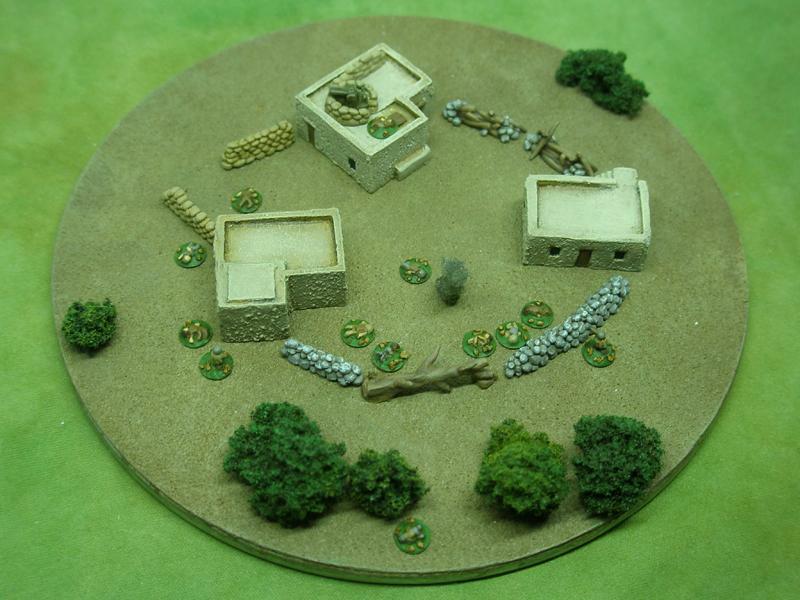 Similar to my Tiny Air Combat project this is a scaled down more compact version for 3mm ground games. The lid is used as protective cover for the minis stored on the underside. There’s a height limit of 10mm for miniatures that can be stored but unlike the CD cases these fit in a pocket. 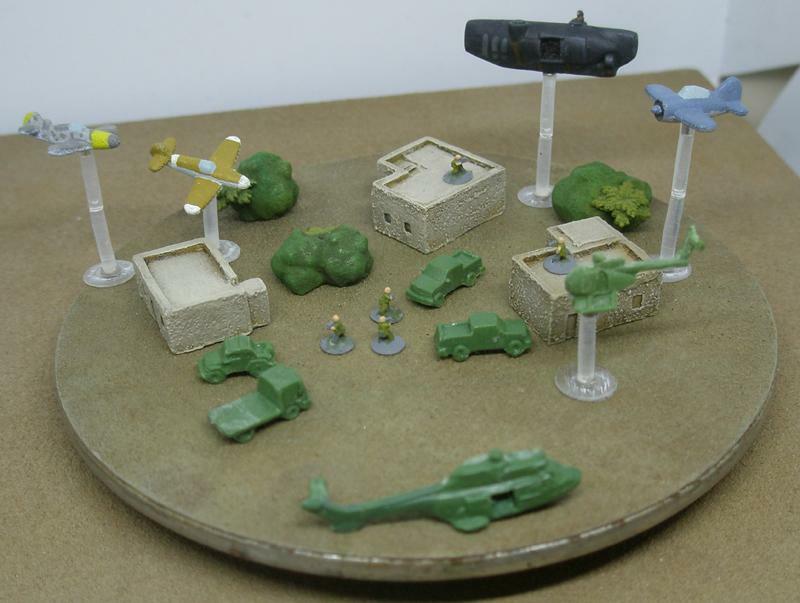 Planning to do several dioramas to see if they’ll work better than modular terrain pieces. I could probably print a small reference sheet and stick it on the lid, laminate it a little for water proofing. I should also make a spacer as a safety measure. Any ideas and suggestion for improvements is welcome. 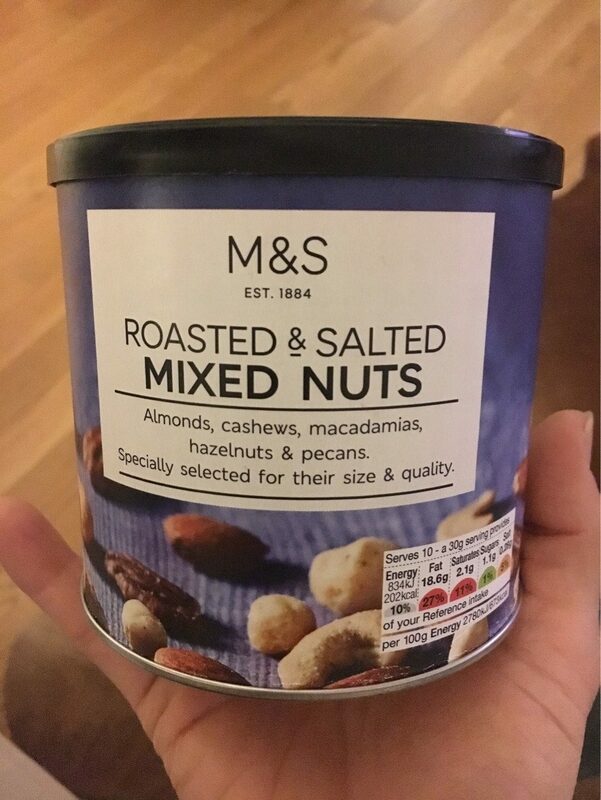 These are the lid top and metal bottom from M&S nuts. Although any type would do I have a preference for honey roasted cashews. 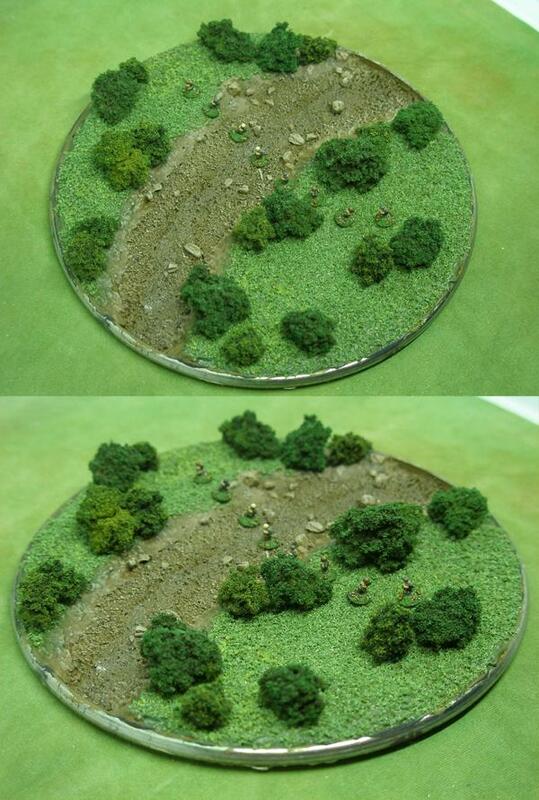 Around 4″ wide the plastic lid is flexible enough to accept 10mm tall terrain. As per usual, you’re knee-deep in the tiny super cool. So you’ve got mercs in the air, looks like mercs on the ground, they need some air support. Maybe an Mi-35 (not sure how you’d do helos at this scale), at least some prop-jobs like a Pucara of Skyraider. My only criticism is I don’t have one! Have you seen my mini Hoth? @Oldben for the small price of a tasty snack and some sandpaper you can also have one of these. I saw your mini Hoth, Lego are so well suited to making buildings at this scale, so many useful shapes. Are you going to build on it? If you’re looking to replace your infantry I suggest Odzial Osmy or Vanguard 3mm, they both have infantry in trench coat. @Jack – I do have some air but no deadly modern stuff. My preferred mode of transport these days are flying submarines (got carried away with black wash). I dropped the modern stuff for scifi/steampunk. I’m hoping to get some gloss varnish soon to paint the water. Trees are removable but I need to soak them in PVA to make them more rugged. And singly-based 3mm dudes, absolutely incredible! Very cool, can’t wait to see some fights, and the back story to them. Thanks, it was easier to make than I thought and would be easier if I didn’t use techniques I use for miniatures. I wouldn’t be posting any ground games, they’re too involved and the setting is too dark and morally corrupt to share. I’m going to use this to share my random ideas and experiments. Pretty happy with how the obstacles came out, my only regret is using the same color for the stream. For what it’s worth, I wouldn’t sweat it, the stream looks great. Hell, the whole thing looks great, very impressive. How do you get such bright (but not washed out) pictures? Are you using a light tent and a damn searchlight? Your pics are always so clear and so vibrant, mine… not so much. I use a light tent, it’s the only way to get enough light where I live. The tent makes too much light, the colors are a little faded. 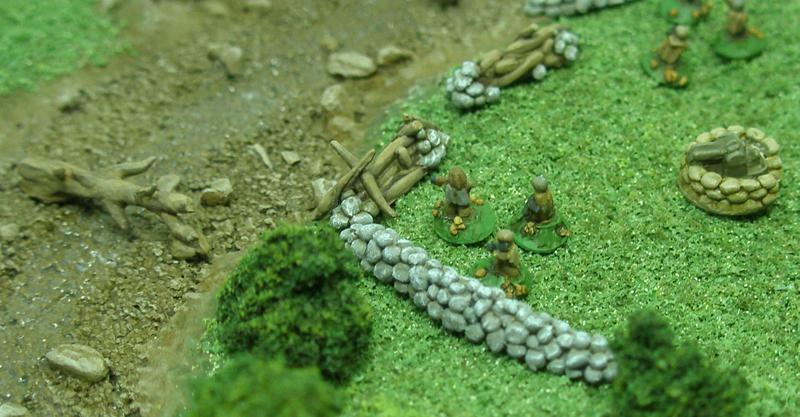 It’s funny the stone wall and barricade makes me think of the American Civil War. The game I had in mind was to play the evil side, think steampunk Nazi. Posting the game isn’t a good idea because I’ll be carrying out multiple crimes and evil doing. Now that most of the assets are done I’m having second thoughts, it might be better played in a fantasy setting. Some stuff feels out of place in a technological setting, like relationship between justification for conflict, industry, resource and population size. Too many dependencies in the industrial age for small population to go all out conquest mode. Agrarian based societies doing that seems more plausible. This is so much clearer, I need to be taking tighter close up photos. Certainly your prerogative, though I’ll beg you to share pics, even if you’re not providing a write-up. I don’t think I understand enough about ‘Steampunk,’ much less your particular version/vision, to comment on justification for conflict, industry, resource and population. Thanks Thuseld, what I like about this most is their size, I could make a lot in a week. The aftermath. Yup I stole the casualties idea from Just Jack. The only reason the 4 man team won was I made the defenders disadvantaged by not knowing where to shoot after leaving the buildings. Brilliant! 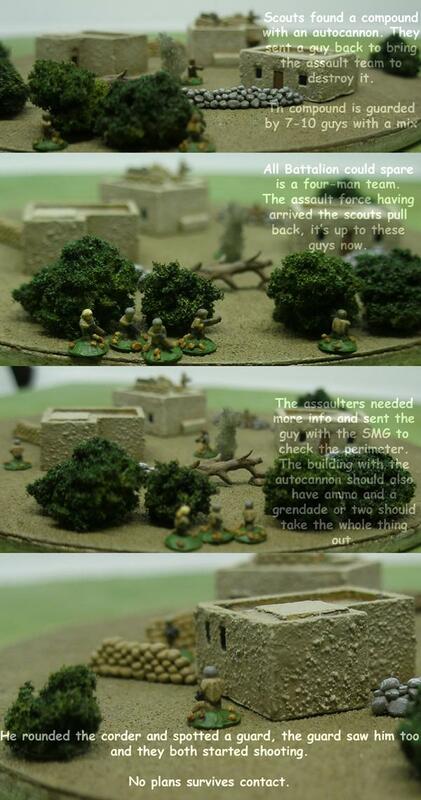 Battlefield in a nuts tin. Just goes to show you don’t need whacks of stuff to get a game going. Really does look the part. As Thuseld said it is really inspirational. Certain got me thinking about small scale game. Pure awesomeness, as usual. Thanks so much for posting that, a fun read and great eye candy, it’s got me checking through spares boxes to see if I could get into something like this, albeit in 6mm or 10mm scale. I’m guessing the assault team accomplished its mission of taking out the auto-cannon? Looking forward to the next fight, maybe an enemy counterattack, or extraction under fire? Capturing the compound would be nice though with only 2 guys they’re better off blowing it up and be done with it. I’ll see where the randomness takes me. I kind of like this looking like a desert but it’ll be flocked soon. Sounds good, man, can’t wait to see what you come up with next. I love the look of the new ‘tin,’ not sure you even need to flock it. I really like the trees, super cool. 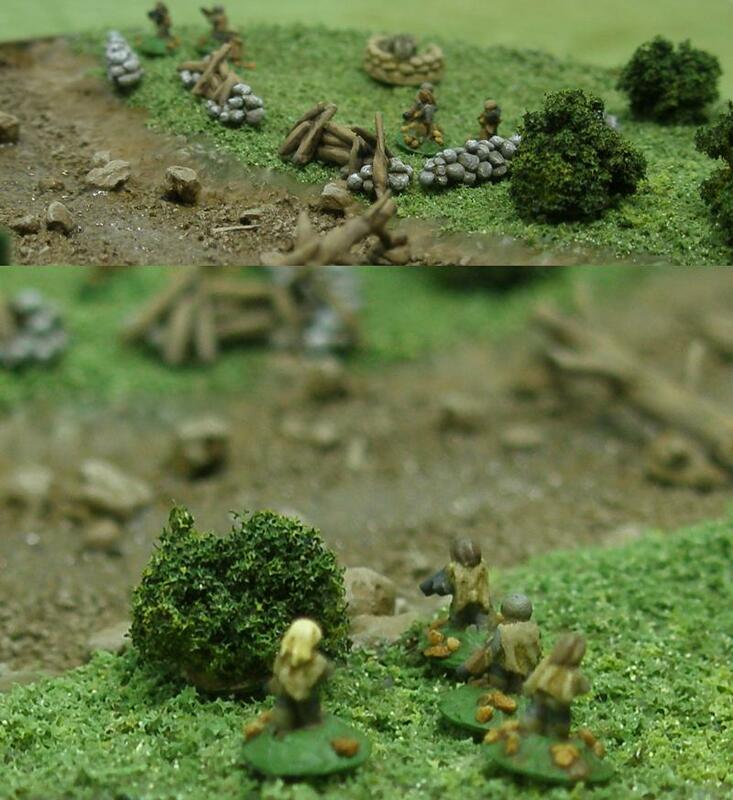 I pulled out some spare 10mm troops to ponder something similar to what you’re doing, and thought to myself, ‘man, those are small.’ Then I reminded myself you’re doing it in 3mm! Jack, you’re spoiled by larger miniatures. These should be the last terrain, I’m out of tin bottom. This reply was modified 5 months, 2 weeks ago by Thomaston. I’m out of tin bottom. Thanks, but I need a break to collect more inspirations. Going bigger and a turn towards the stars. 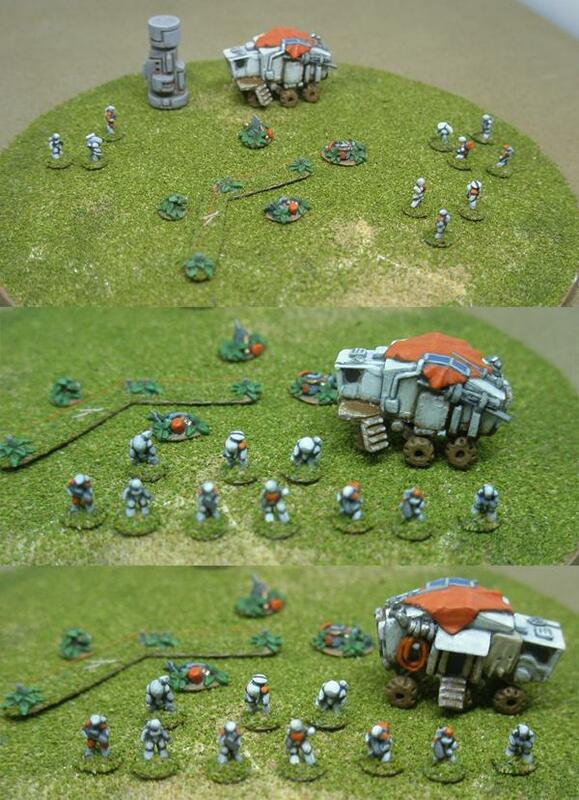 6mm space infantry and a mech. Those look really cool, sort of Rocketeer like. I love Jovian Chronicles, it’s a shame it’s not more popular. I like sculpting dynamic poses and floating in space gives so much possibilities. In space no one needs terrain. My goal of jungle terrain is a little closer. I probably need more trees. This thread’s amazing – what flock do you use? It’s great for this scale. I used ground olive stones. It’s sand like and I’ve been using medium grit sandpaper for larger boards, painting and dry brushing them. I’m just not happy with sponge based flock/foliage any more. So far I’ve only been able to find it at this one place. If anyone know of other places I can find these please share. Thanks for the link. That model hobby shop looks the business. The best thing since sliced bread, just what I need me thinks. Did you make the palms trees or purchase them? Fun project, looking forward to the sci-fi one! I visited 4D in 2014 and can confirm that it is a modeler’s paradise. It is a small store built into a railway arch in east London and it has absolutely everything you could want for terrain making. Highly reccomended. 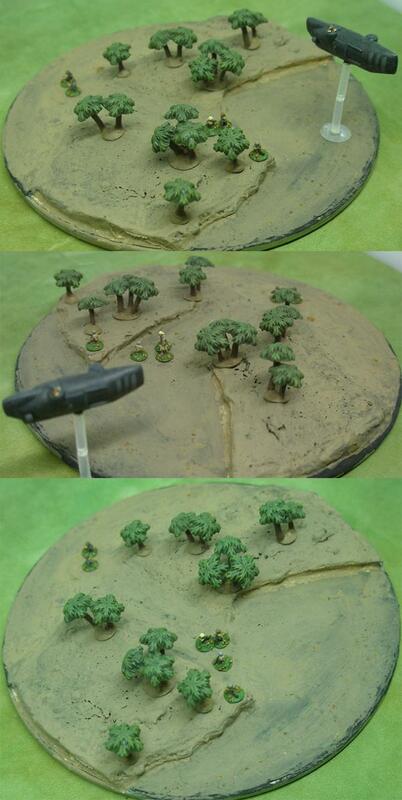 I made the trees, they’re based on the plastic trees GW used to make. That is incredible dude! Like, picture perfect incredible. Thanks DSG, I was dreading it before I started but once I got it rolling sculpting the underbrush was kind of fun and easier than I thought. Some objective markers and scifi infantry and a crawler. The grey+yellow infantry in the middle set of photos are from Oddzial Osmy. I should stop resizing photos, lost a lot of sharpness. That is amazing stuff! Very inspirational indeed….. not like I need another magpie moment and project, but after seeing these photos I don’t think I can resist. O8 and vanguard make nice 3mm stuff, is there anyone else….? please keep posting the eye candy! Wow. I started at the bottom and as I scrolled up I expected to see what company produced that wicked vehicle..